The Nathan E Stewart tug boat as it sinks in October, 2016. Triquet Island at low tide. Photo: North Sound Sea Kayaking Association. The Department of Fisheries and Oceans says the tug Nathan E. Stewart hit ground on Edge Reef near Athlone Island just after 1 am this morning. Heiltsuk elected Chief Marilyn Slett says the tug sank completely just before 10 am, and that the Nation’s most recent estimate is that it has spilled more than 200,000 litres of fuel. TERRACE, BRITISH COLUMBIA–(Marketwired – Sept. 1, 2016) – Northwest Aboriginal nations have emerged from two days of meetings with the federal government demanding that its “deeply flawed” environmental assessment of a massive LNG proposal be delayed, in light of unfair and incomplete consultation with affected First Nations. Keepers of the Coast takes a close look at how the Kitasoo/Xai’Xais, Heiltsuk, Nuxalk, and Wuikinuxv Nations are stewarding our marine territories. 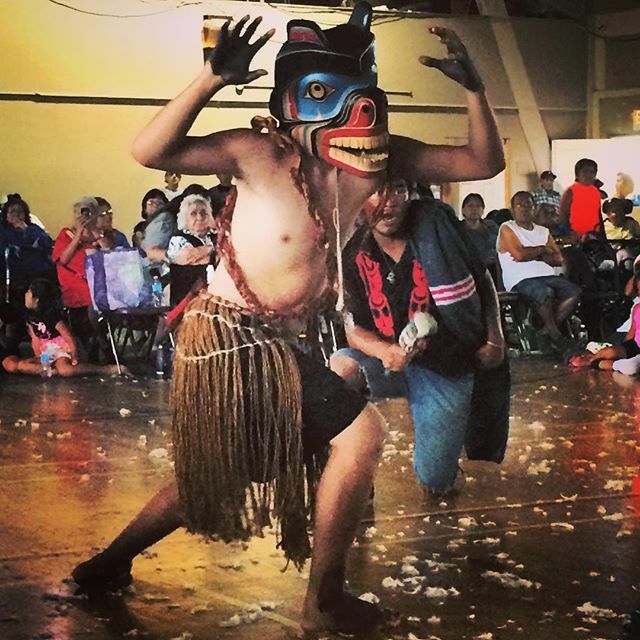 A Grizzly Bear dancer performs during Potlach in Bella Bella marking Haida and Heiltsuk peace treaty. Photo by serenahavana via Instragram.